Wow!! As wedding venues go, Farnham Castle is definitely up there with the best! You may remember, at the beginning of our holiday we had a wedding to go to; that of Maddie (the daughter of some close friends of ours) and James. 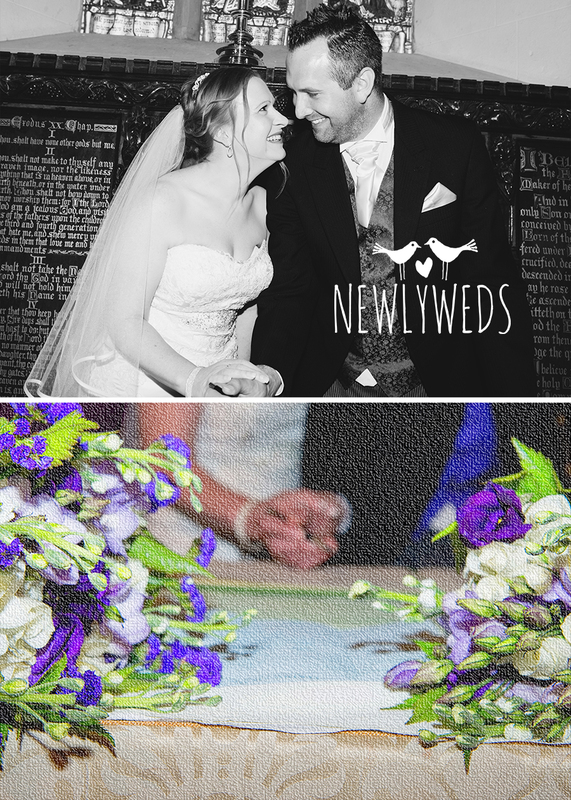 We were over the moon to take their photographs at this stunning venue. ‘Twas a busy day for sure, but such a joy to photograph a lovely couple in this amazing setting! The Old Gatehouse is where the bridal party get ready for the day ahead. The Gatehouse is designed perfectly for the purpose. It has a comfy downstairs area; refreshments had been laid out here to keep everyone going throughout the morning. The hair and makeup ladies were hard at work in one of the upstairs rooms, with the dresses and shoes set out in another, which had glorious light streaming in, so great for photos to be taken. Whilst the girls were getting ready, we took some shots of the preparations going on in The Great Hall. James and his groomsmen arrived along with some guests and we took some shots as they chatted on the Great Lawn in front of the castle. 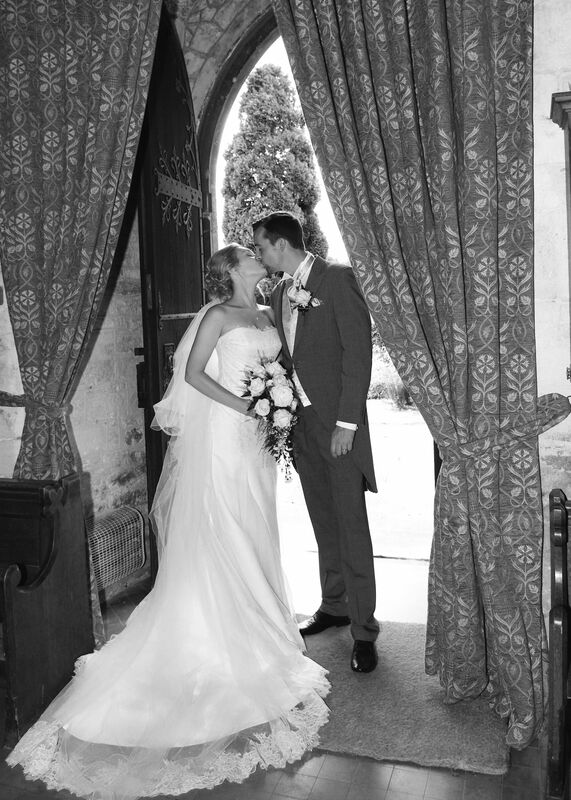 It was back to the Gatehouse then – the beautiful bride was almost ready to go! Maddie’s mum and our good friend, Trudy, is a registrar and she had been granted permission to take the ceremony which made it particularly special. Everything certainly runs like clockwork at Farnham Castle – extremely well organised, and the staff are very friendly and helpful. After the ceremony, the guests are asked to line up along the main staircase, with a glass of Pimms in one hand, and a handful of confetti in t’other, and the bride and groom then mosey on down the steps being showered by confetti. A magical site to behold – and of course great to photograph!! 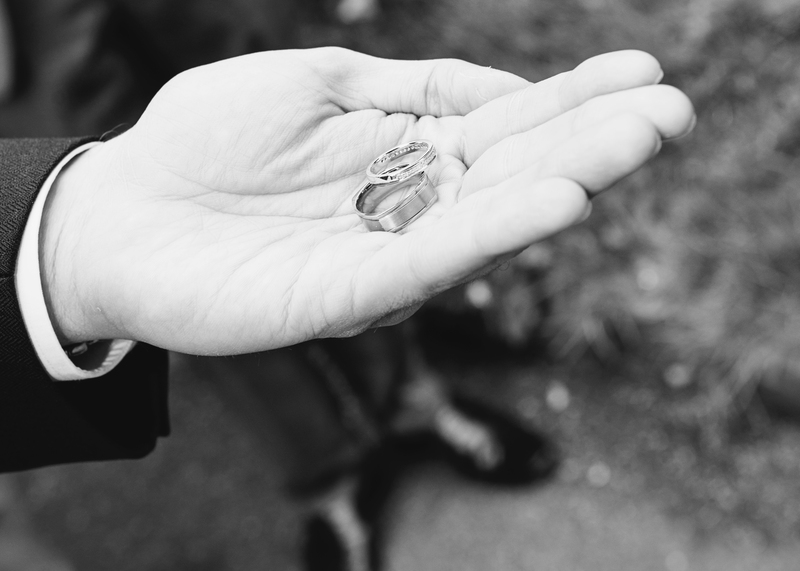 We were told an amusing story of one occasion when a guest inadvertently threw their Pimms instead of the confetti at the bride and groom – oops! I suspect wasn’t very funny for the bride and groom at the time!!! Then it was a quick run upstairs for me to take the main group shot of the newlyweds and their guests in front of the castle from a top floor window – a perfect vantage point to get both the guests and the fantastic view across Farnham. The gardens are beautiful, and lend themselves perfectly to the romantic bride and groom shots, and there is the added bonus of photographing the happy couple in the castle ruins too, with its wonderful ancient walls and amazing views. 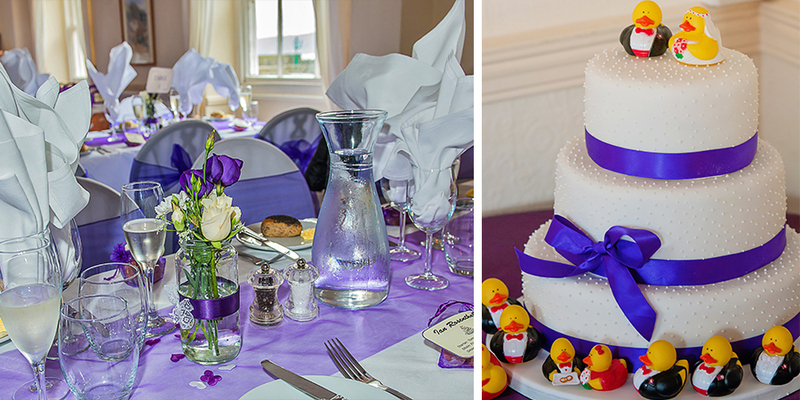 The wedding breakfast takes place in the 12th century Great Hall http://www.farnhamcastle-weddings.co.uk/venue/the-great-hall/ The meal is exquisitely presented – and delicious too! The balcony overlooking the Hall gives a splendid vantage point to take some pictures of the speeches, tables and later the dancing. A bird’s eye view of the speeches! So it was into the early evening and there was a beautiful relaxed atmosphere as the bride and groom mingled with their guests in the castle grounds before cutting their cake and having their First Dance. Then it was dancing till midnight, and a hog roast feast just in case anyone was still peckish! Our photo props seemed to go down a storm and a good time was had by all. We stayed in the Castle overnight, and we were all treated to a generous continental breakfast the next morning in the brightly decorated library which was a super relaxing way to finish the celebrations. 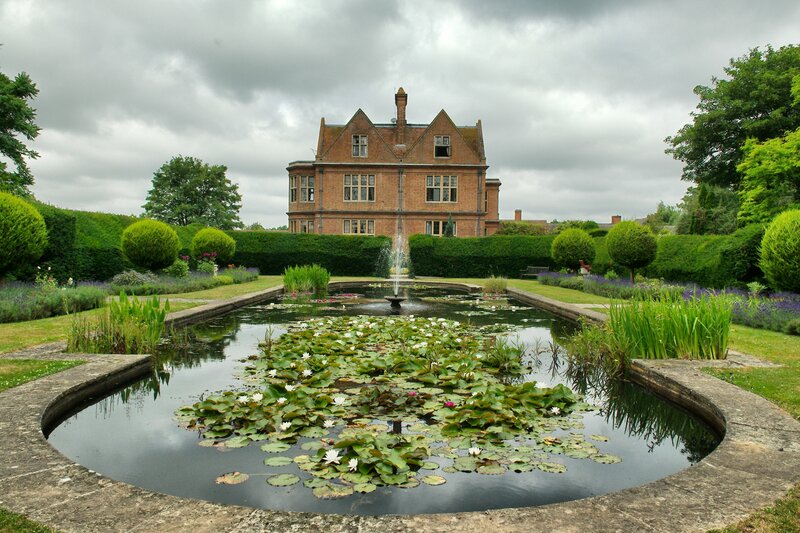 For anyone out there researching wedding venues at the moment, Farnham Castle might be well worth a look! 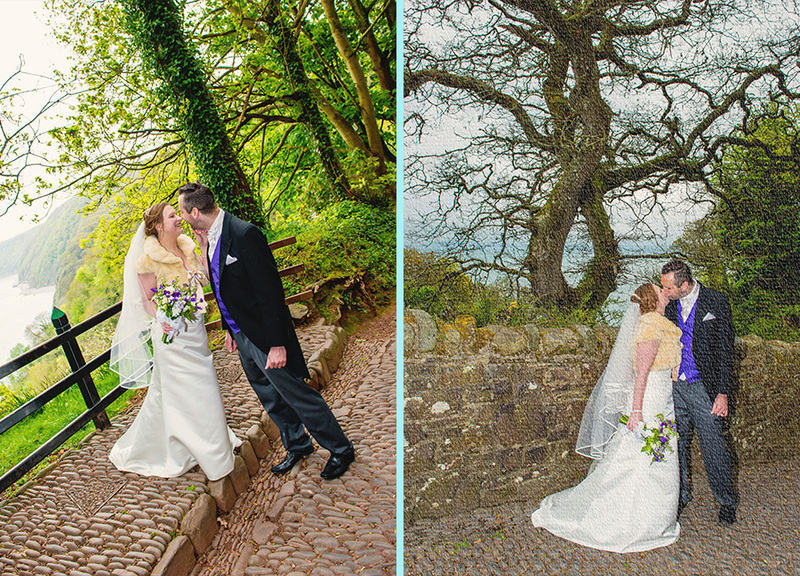 I’d never have imagined then that one day I would be walking along that very same, steep hill – which still looks pretty much the same as it did all those years ago – photographing a beautiful wedding! 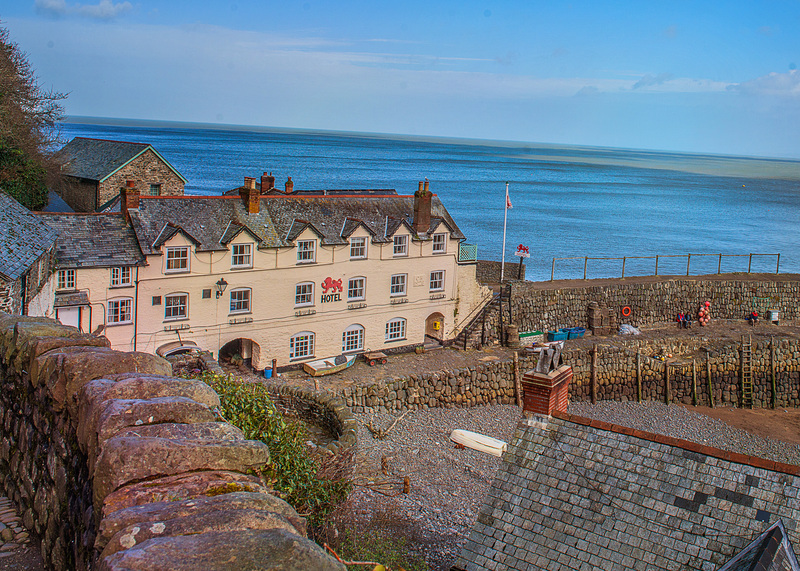 When our sons were much younger, we took them to Clovelly for a day out whilst holidaying in Devon. Another very memorable day … especially the boat ride we took out to sea on one of the fishing boats from Clovelly harbour. The boys and Lee thought it was great fun and extremely exciting. Me? Well, naturally I was scared out of my wits being in that little boat on the very choppy water … and obviously my family found this highly amusing!! I have to say, I was very relieved to get back onto dry land! So of course it was fantastic to be asked to photograph a wedding in such a picturesque location, with such fond memories attached to it. The weekend of the wedding, at the beginning of this month, came round before we knew it. 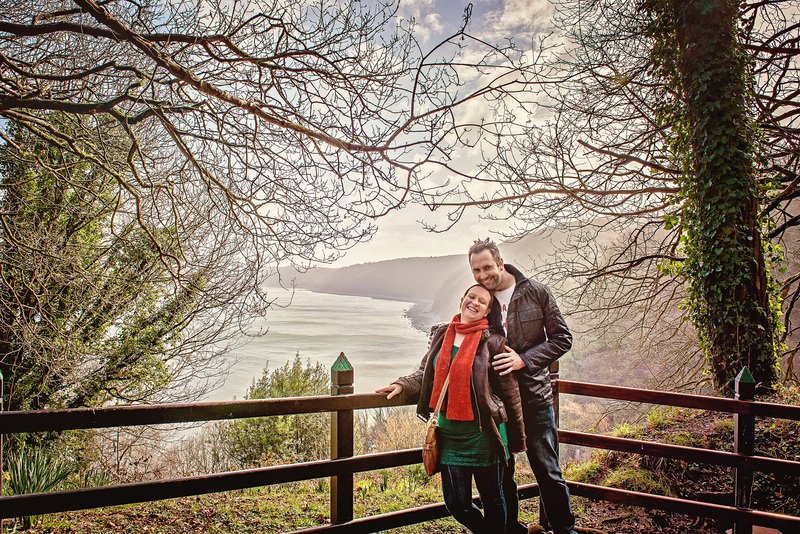 Lee and I travelled down to Devon on the Friday and we all met at the church – the historical All Saints, http://www.clovelly.co.uk/village/places-of-worship – that evening for the rehearsal. We always try and get to the wedding rehearsal if possible, as it’s a great opportunity to introduce ourselves to the clergy and ask where we are allowed to stand during the ceremony etc. The vicar in this case was very obliging indeed, very friendly with a wonderful sense of humour, which made for a relaxed time for all concerned. We took some test shots as the rehearsal got underway, which was of great benefit in preparation for the ceremony itself. Our first stop of the morning was to the bridal suite to take some early getting ready shots of Karen and her Matron of Honour. All seemed nice and calm, although I expect there were a few butterflies! 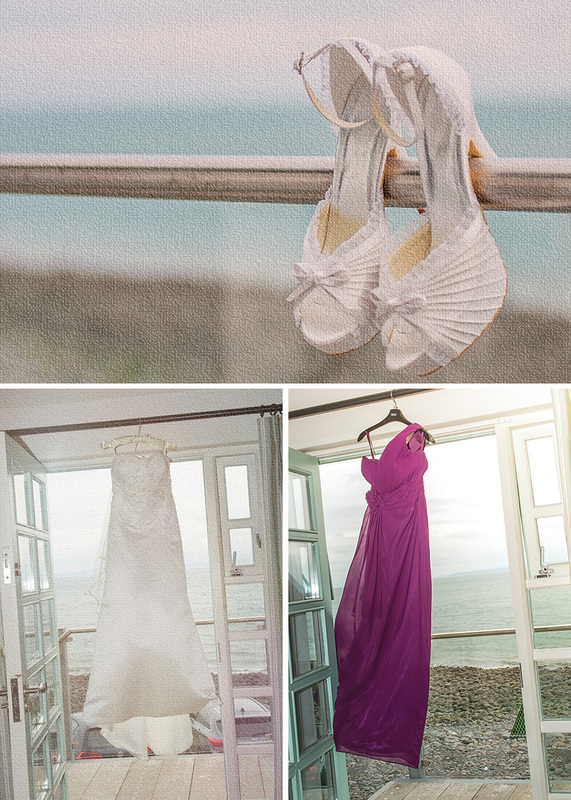 The bridal room at the Red Lion in Clovelly harbour is quite exquisite and beautifully decorated. It’s a super light, airy and spacious room, with fantastic views out to sea. 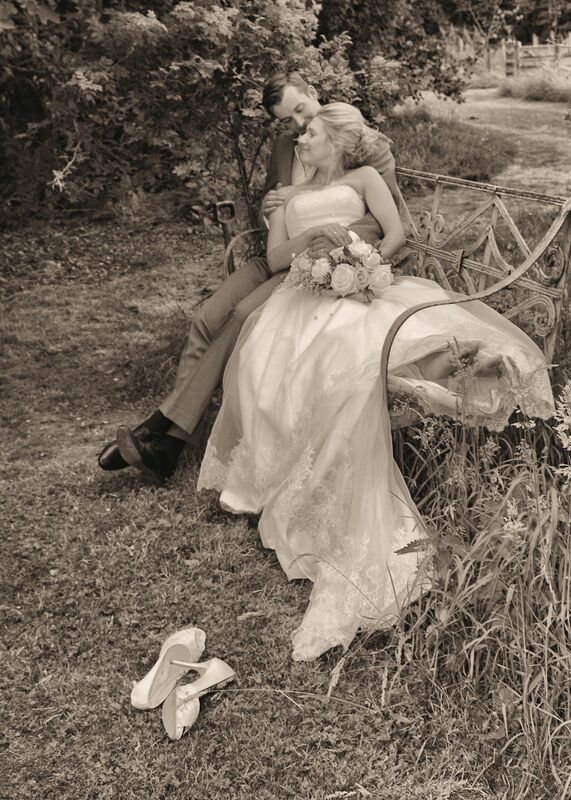 A superb backdrop for the dress, shoes and flower shots! James and his Bestman had stayed overnight at the New Inn, halfway up the cobbled street. 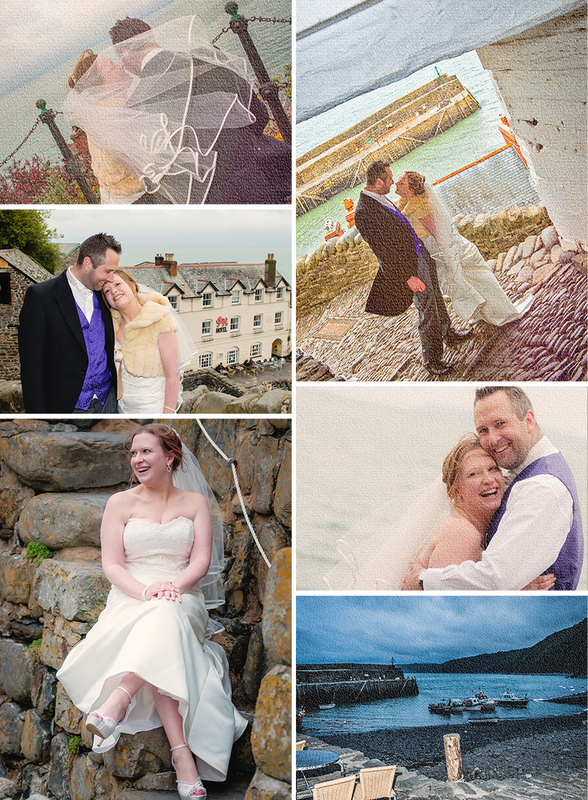 They wandered down to the harbour area mid-morning, so we could get some shots of them against the brilliant views whilst the tide was out (making sure they were well out of sight of the bridal suite of course!). Most of the wedding guests were staying in the Red Lion, where the reception was later to take place. The Clovelly Landrovers were on hand to transport everyone in stages to All Saints Church, back at the top of the hill. James and his groomsmen were the first to head up to the church, and Lee and I followed shortly after in the next Landrover with the first group of wedding guests, so we could take the groom and party pictures at the church, as well as some informal pictures of the guests as they arrived. Once these shots were in the bag, we hitched a ride in the Landrover going back down the hill, so we could take some more photos in the bridal suite. By this time, Karen was almost ready. 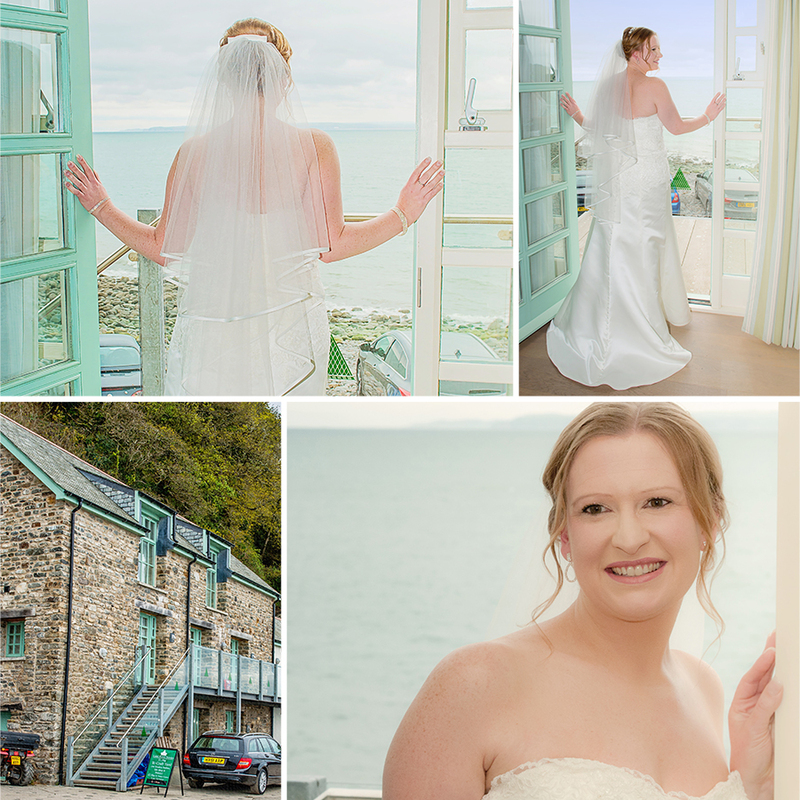 We were able to get some gorgeous shots of her looking out to sea as well as those with her mum and dad and Matron of Honour. 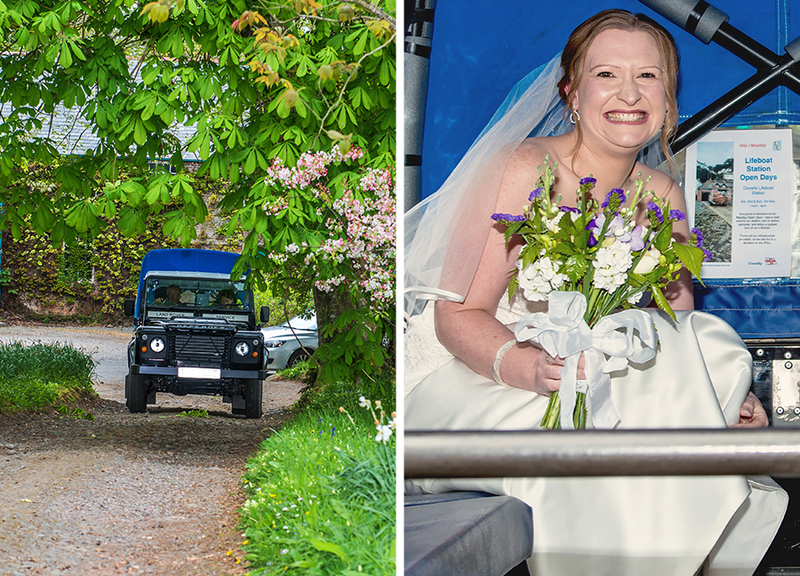 We then jumped in a Landrover back to the church to await Karen’s arrival with her dad. 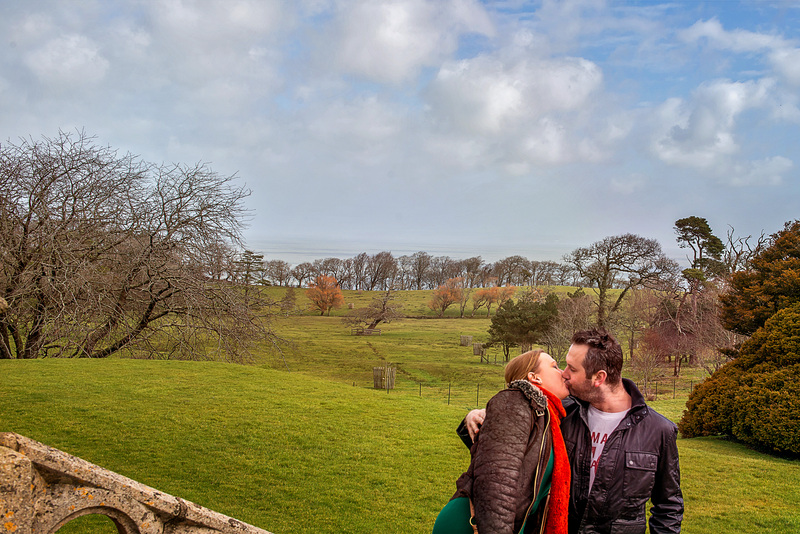 After the ceremony, we walked round to the gardens at the back of the church, with such incredible views – a fantastic backdrop indeed for the new “Mr and Mrs” to have their special shots taken with their family and friends. 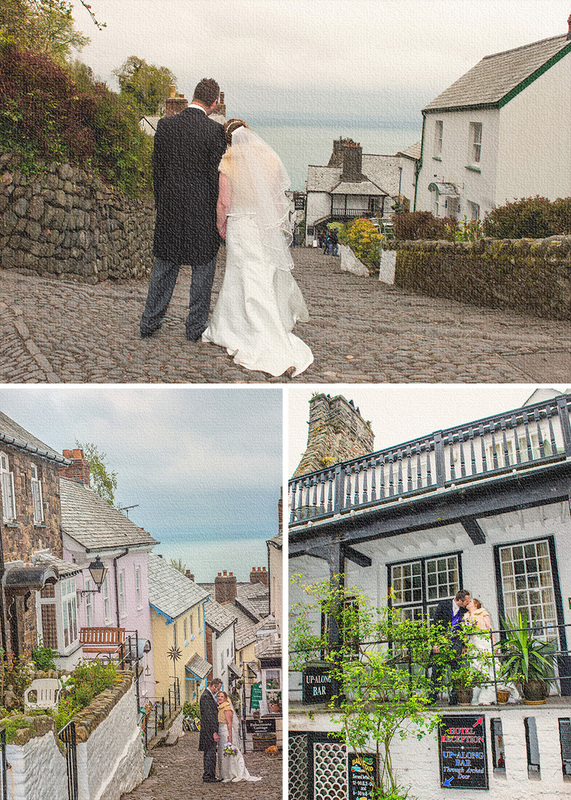 As the guests then made their way back down to the Red Lion in the Landrovers, I walked with the newlyweds to photograph them as they ambled happily together down the famous Clovelly cobbled street. 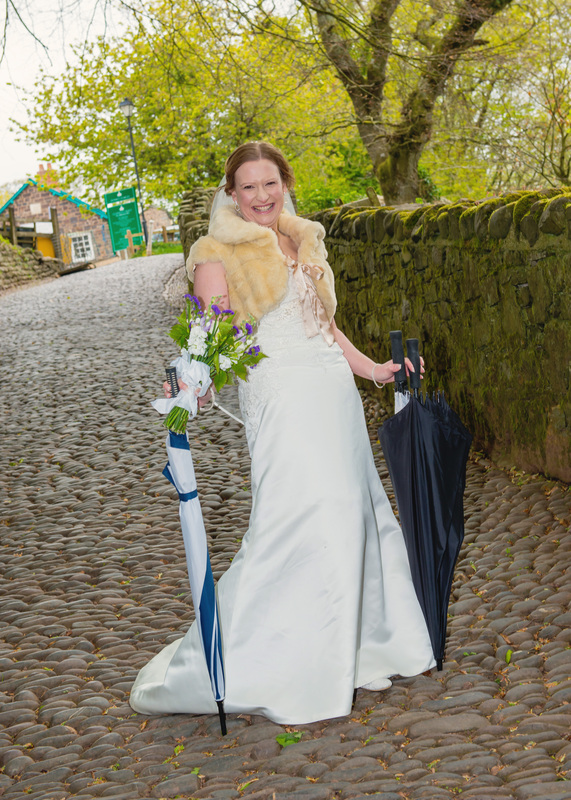 The bride looking very stylish with the brollies! It was a marvellous atmosphere, with the friendly locals shouting out their good wishes as we wandered along. Lee in the meantime drove our car, which was parked at the church, back to the Red Lion and then walked up from the bottom of the hill to meet us half way – he had the tougher job – definitely much easier walking down the hill than up! 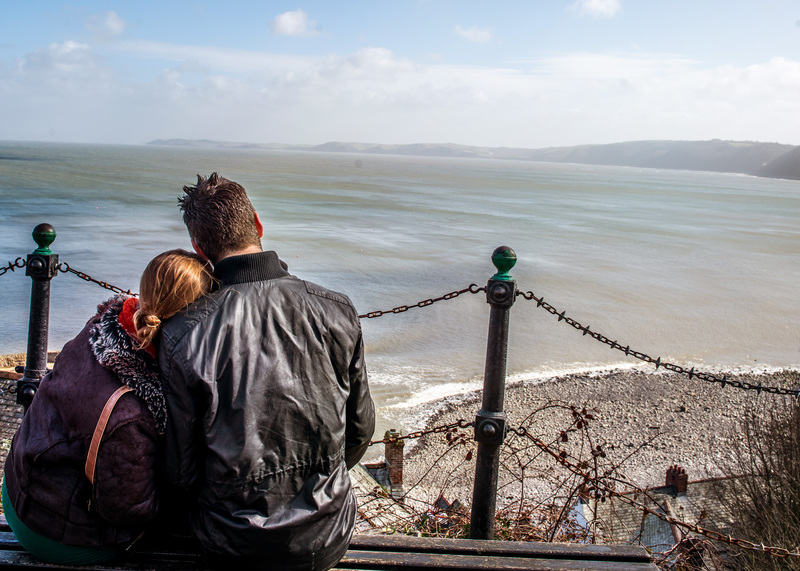 We did some more shots on the stoney seafront and in the harbour of Karen and James later in the evening – yet more amazing photo opportunities! The party got underway and everyone let their hair down and had great fun – the hilarious “photobooth style” props went down very well with the kiddies – and the adults too as the evening got into full swing!! 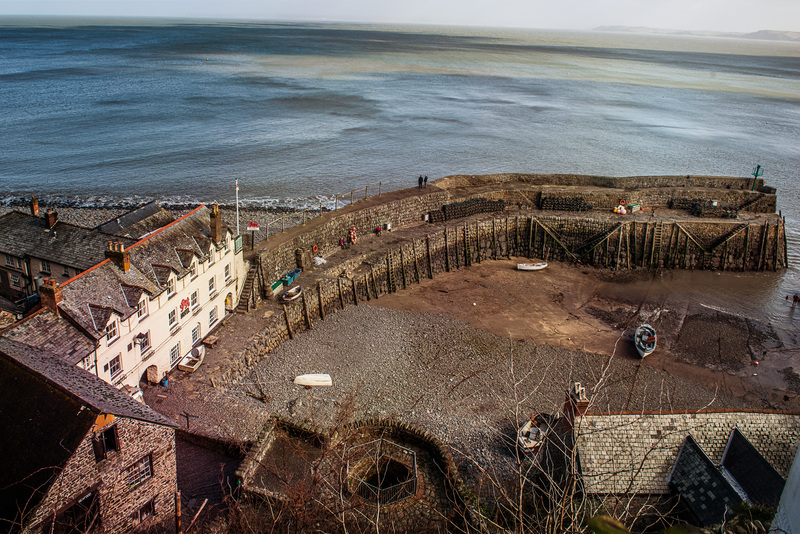 You’ll see I’ve added a canvas effect to some of the shots for this post – which I reckon is rather apt; the village of Clovelly is like stepping into a picture-perfect world – even on a cloudy day! A very nice perk of photographing weddings means we get to see and take pictures in some pretty amazing locations. 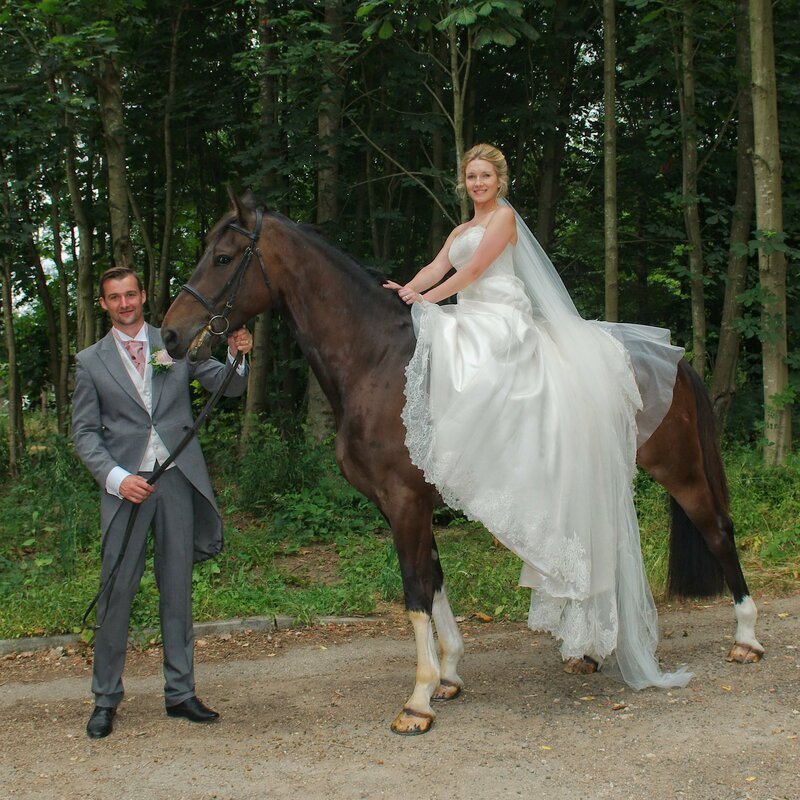 South Farm in Royston, Hertfordshire, is certainly no exception – a truly stunning venue! It was brilliant to amble round there earlier this week, in the glorious sunshine, for our pre-wedding meeting with the lovely bride and groom-to-be. As you can see from the pictures, we’ll be spoiled for choice on the day – with its glorious greenery; lakes; gypsy caravans and colourful flowers; there are also some plush rooms and a staircase inside the main house, good for a Plan B should it rain, but may take advantage of in any case for certain shots as it’s so charming. The wedding itself, weather permitting (please, please!!!) is to take place outside on the large lawn in front of the house. 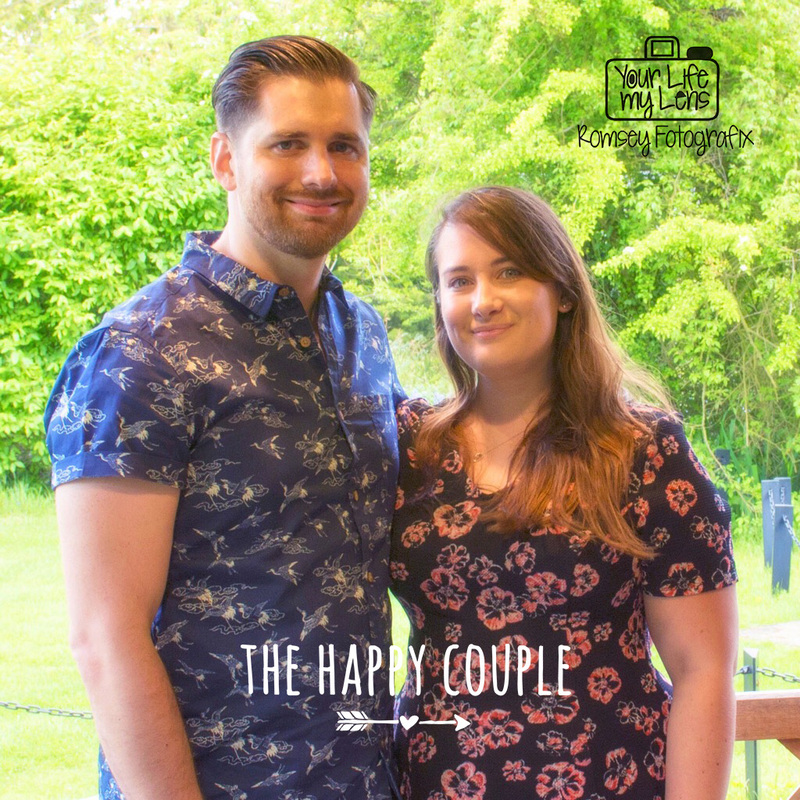 The happy couple will say their vows in the summer house on one side of a small lake, with their guests watching on from across the water. It’s good to know there is the option of using the Old Dairy for the ceremony in case of rain. Ceremonies at the venue sometimes take place in the Tudor Barn, or, for smaller weddings, in the Drawing Room. There is a large courtyard area, ideal for taking the large group shots, as we are able to access one of the bedrooms to get a high viewpoint … ahaha no hiding at the back then 😉 Then so many different nooks and crannies for taking the newlyweds for their romantic shots – as I said, spoiled for choice! The wedding breakfast and reception takes place in the barn, which is a good size and very well lit. There are lots of rooms for your guests to stay – including the gypsy caravans, and plenty of space for camping too. 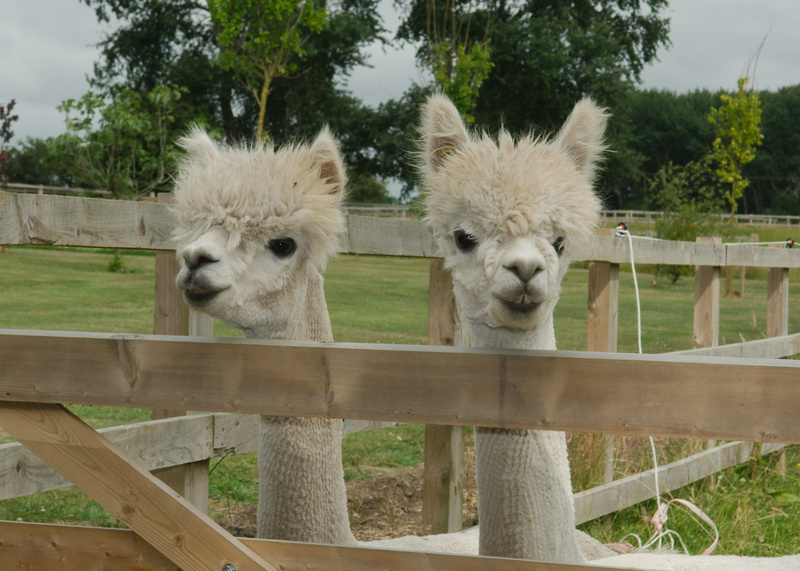 And of course there is the added joy of seeing all the farm animals! So if marriage is on your mind and you’ve yet to find a venue, South Farm is definitely one to consider. We’re very much looking forward to it 🙂 I’ll report back after the event!! 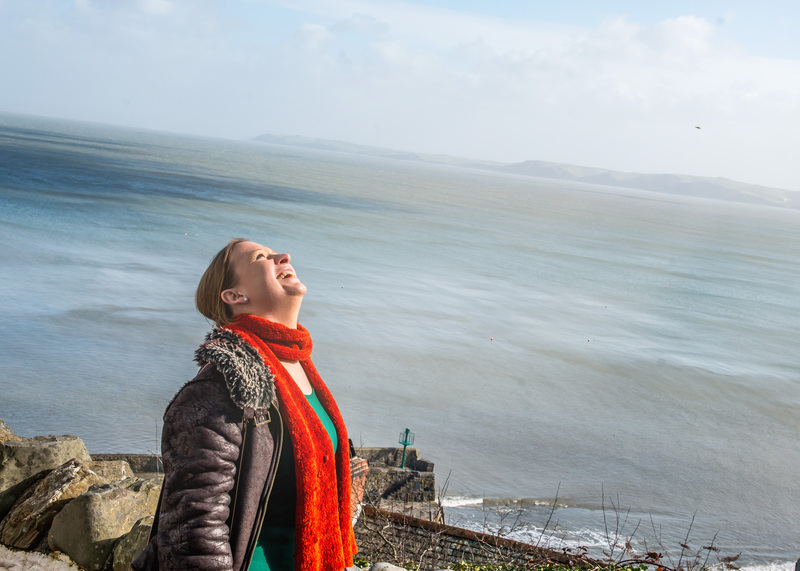 Think of an extremely steep, olde worlde cobbled street, donkey rides, and the best views of the sea you could ever wish for … and where might you be? Yep, you’ve guessed – it’s Clovelly in North Devon of course – which is where we’ve been this weekend 🙂 We’ve been lucky enough to be asked to photograph a wedding there in a couple of months time, which is brilliant, so we took a little visit to meet up and look around with the lovely bride and groom-to-be, Karen and James!! As wedding venues in the UK go, this would have to be up there as one of the most perfect settings. It was a fabulous treat for us to have this opportunity and it also brought back some great childhood memories of the place. 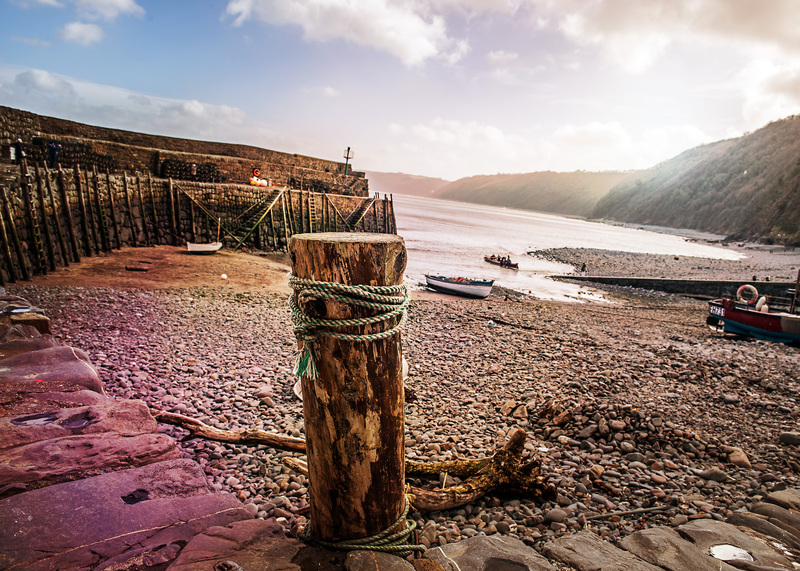 Not a lot has changed about Clovelly since those good old days. It’s still as charming as ever, and just like stepping back in time. We stayed in the nearby Hoops Inn http://www.hoopsinn.co.uk/ which, by the way, we can highly recommend – the food is out of this world and our room was very comfy. 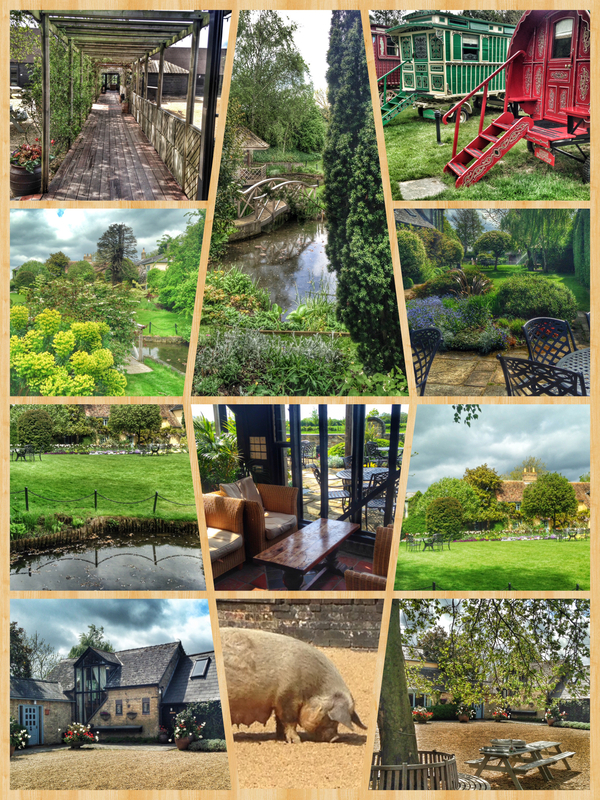 The Inn has a very warm atmosphere and the folk there are very friendly and welcoming! We arrived late Saturday afternoon and managed to get drenched in a downpour as we took an impromptu fleeting visit to nearby Bude to meet a friend, so it was a great relief to wake up to the sun streaming in (1st March and spring is in the air!). After a delicious full English breakfast, we headed off to meet Karen and James at the historic All Saints church (built in 1200), where they will be tying the knot. 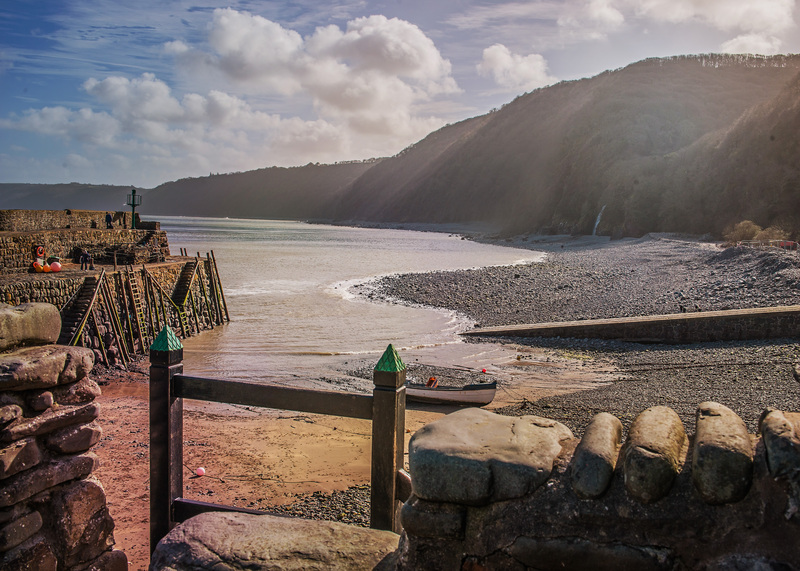 The church is set back from the road, a short walk away from the entrance to the famous cobbled street of Clovelly. 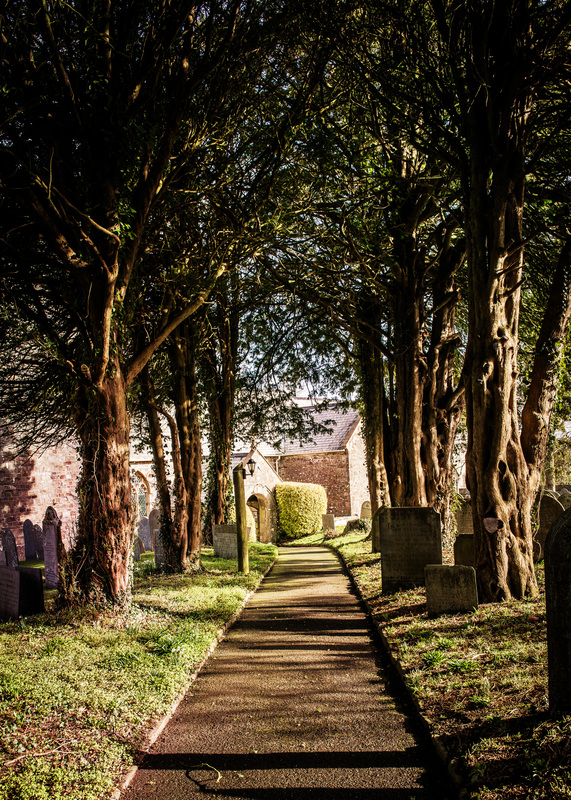 The walk up to the church door is via a pathway arched by trees, quite beautiful, especially with the sun seeping through the branches. The church is built in typical Norman style; very quaint and obviously steeped in history. Great for sure but the hidden gem lay in the adjacent gardens – superb greenery with incredible views of the sea in the distance – talk about take your breath away! Such a stunning backdrop for the wedding guest shots after the ceremony. That in itself is a photographer’s dream, but then of course you have the more familiar part of Clovelly, which I’m sure many of you will know and love – personally I have very fond memories of it from childhood holidays – the steep hill, the donkeys (which aren’t about this time of year) and those famous cobbles. Anyway, we headed off down the stoney path, soaking in the stunning views of the sea and scenery as we went, and naturally taking some shots of the happy couple and the views along the way. How amazing is this place! 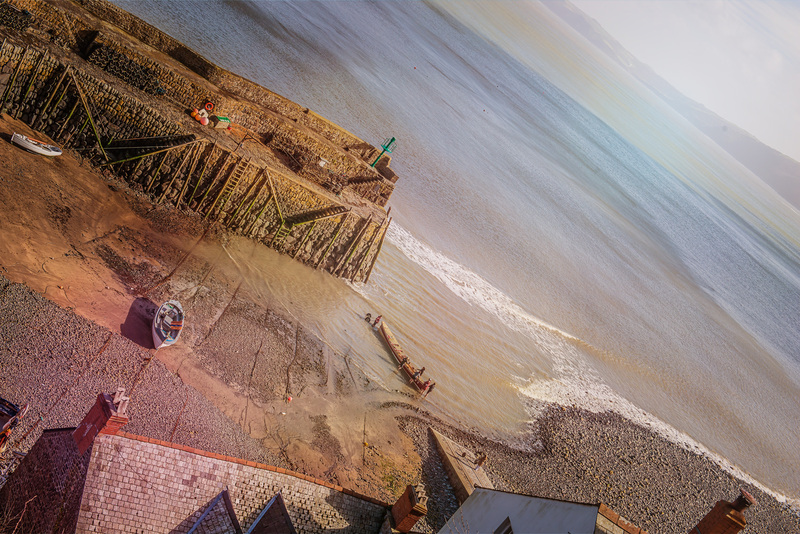 The picturesque harbour, with its fishing boats and cottages, is a fantastic sight as you reach the bottom of the hill. 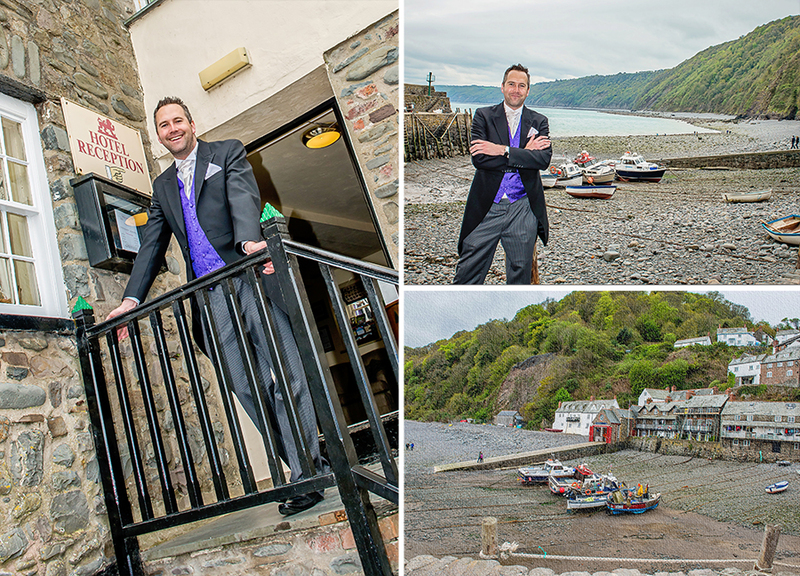 The reception is being held in the Red Lion, with its superb views across the harbour and out to sea. After a good lunch and lots of chatting in the Red Lion, Lee and I said our goodbyes to make our way back to the car, which of course was parked back at the top of the hill. Climbing back up the steep hill was my biggest challenge of the weekend; I really should get to the gym more (well get to the gym full stop really 😉 ) Fortunately we made to back to the top just BEFORE the heavens opened. We’d certainly timed our visit right, having had the best of the weather on the way down when we needed it most! 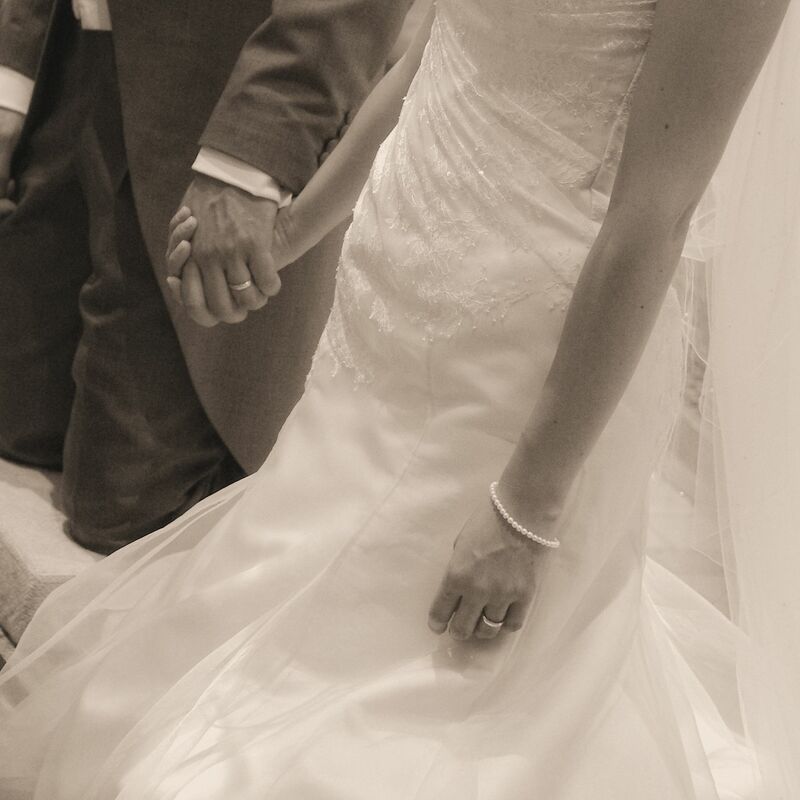 So, all in all, an amazing weekend – can’t wait to photograph the “big day” itself!!! Takin’ Five … and a great wedding! Phew! I am now officially on holiday. This is great and can’t wait for a two week chill out, but making sure that everything that needed doing has been done has been no mean feat, spent the week racing against the clock, and I’m still racking my brains making sure I haven’t forgotten anything. Yep, the lead-up to taking a vacation can be so stressful you REALLY need a holiday by the time it comes around! And when you get back, you spend the first few days playing catch up, eh? But I guess it’s worth it. Will take a few pictures (of course!) as we head out and about – our cameras are always at the ready, and hopefully find time to post a blog or two. In all the rush, I haven’t had time to blog any pics from this amazing wedding we photographed in Winslow almost two weeks ago. We travelled up on the Friday so we could go to the rehearsal and meet the vicar etc, so we know where we are allowed to stand and take the photos – which in this instance turned out to be in the vestry! As it happens, I had a reasonable view from there (once we had sorted out the issue of the flowers, which had been placed plonk donk between the bride and groom and my lens!) But all the more reason to attend the rehearsal, so any such problems can be resolved before the actual day itself. 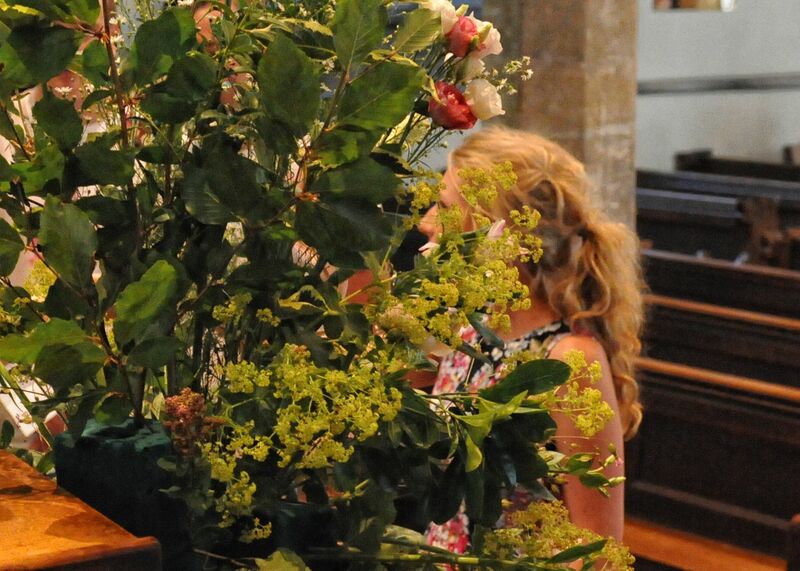 As you can see from the pic – not much of a view of the bride and groom! We stayed the night at the glorious Horwood House Hotel, where the bridal party were also staying, so we could be on hand first thing Saturday morning to take lots of shots of Kirsty and her family and bridesmaids getting ready. The views of the garden from the window of her suite were fantastic and needless to say featured in one or two of the pictures! So a much better view! The new Mr and Mrs! 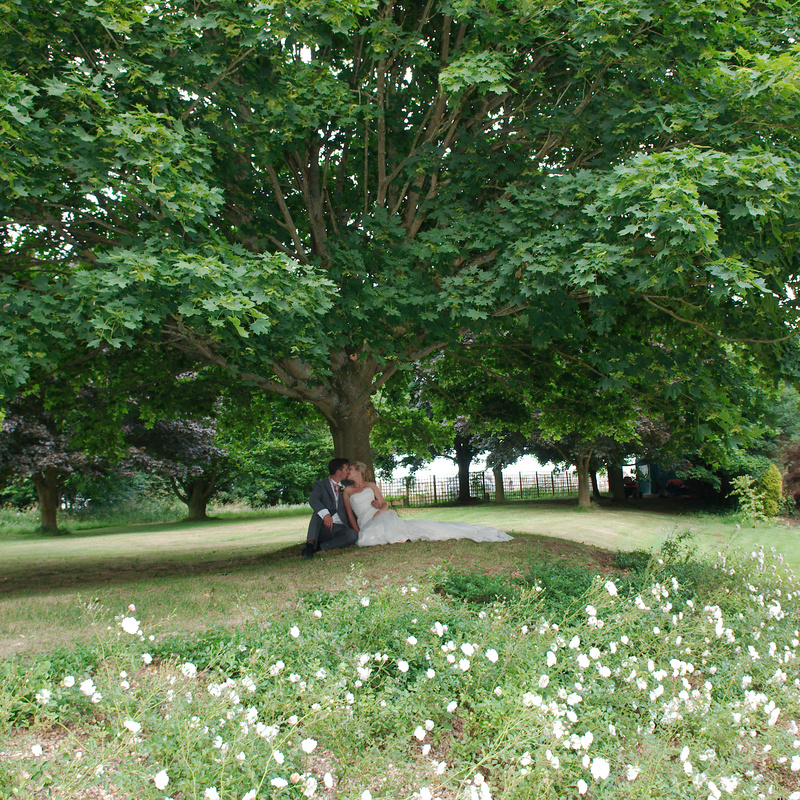 And some idyllic spots to take romantic shots of the newlyweds. 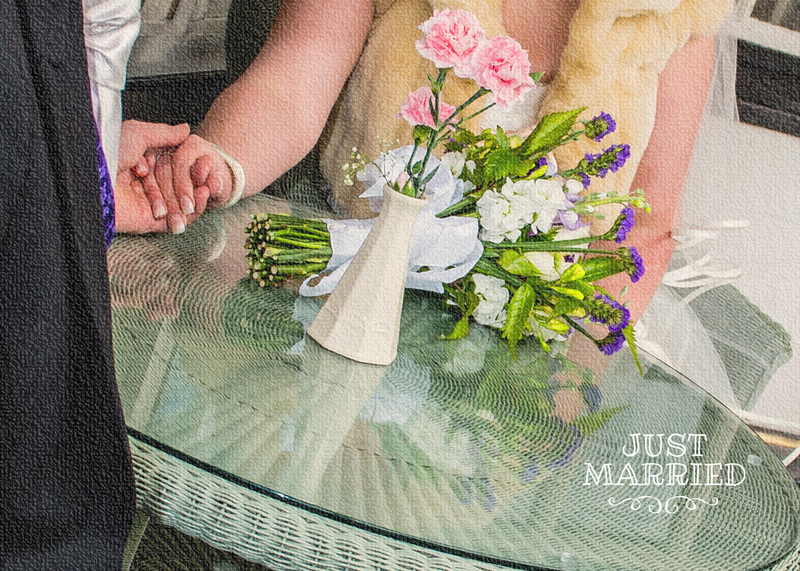 A fun wedding day for sure – congratulations to the happy couple!